One thing I hate about summer in the UK is the humidity that seems to go along with the sunny days we eventually have. I don't know about you, but when I spend time getting ready in the mornings I still want my make up to be on when I get home at night, and unfortunately heat and make up don't work nicely together. 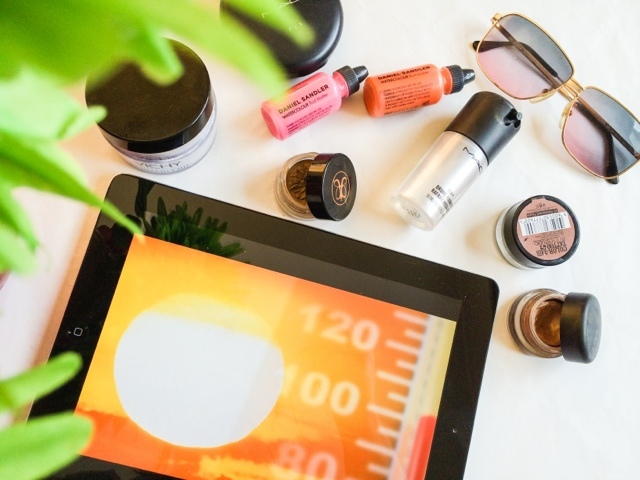 Even though there's no fool proof way of keeping our make up on, bar sitting in a air conditioned room all day, there are a few things you can do to guarantee it lasts a little longer, at least past lunchtime! Keep it simple. Don't overload your face with thick heavy foundations. Instead opt for a lighter consistency foundation and just spot correct any blemishes you may have with a concealer. The most important part is to make sure you set the make up in place. Vichy Dermablend setting powder is translucent and does a great job at mattifying the skin. The finely milled powder sets all the make up perfectly and makes it last. I tend to use this right at the end after applying all my make up, setting foundation, concealer, bronzer and blush to insure they all stay put throughout the day. Take a setting powder or blot powder with you to matte down any shine that occurs throughout the day. If you want to keep your skin feeling really light, mineral make up is a great product to wear this time of year. They tend to deliver a semi matte finish, and the fine mineral make up won't clog pores or cause any unwanted blemishes in the heat. Finish with a setting spray. This will also help to lock the make up in place and also get rid of any cakyness. Again, like the base make up you want to try and keep it semi natural and avoid thick black eye make up, unless you want to look like an ageing rock star that is! (remember KISS anyone?) Cream eye shadow's can be particularly long wearing and can be worn alone or act as a base for powder eye shadows. Water proof eyeliners and mascara will also help keep the panda eyes at bay and keep you eye make up looking its best for longer. Cream and liquid blush do tend to last a little longer on the skin, but try and avoid really creamy textures if you are prone to oily skin as these can be counterproductive and actually fade quicker than powder blushes. Try cream to powder blushes or opt for a blush stain like Daniel Sandler Watercolour Blushes . These last ages on the skin and if set with a translucent powder as I mentioned before, can last all day no problem. Using a long wearing eyebrow product will insure your brows look perfect all day long. Anastasia Dipbrow Pomade is a gel/mousse formula which, once set lasts all day without smudging or fading. A must have product for brow lovers out there to avoid eyebrow melt down this summer! What are your top tips to for heat/sweat proof make up?